What is a Bone Anchored Hearing Aid? Bone anchored hearing aids (BAHA) are appropriate for individuals with a mild-moderate mixed or conductive hearing loss. A conductive hearing loss is a problem in the outer or middle ear that prevents sound from reaching the inner ear. Bone anchored hearing aids use the body’s natural ability to transfer sound through bone conduction. A bone anchored hearing aid is an alternative to a regular hearing aid for those with problems in their outer or middle ears. A bone anchored hearing aid relies on a working cochlea to send sound to the brain. Bone anchored hearing aids offer amplification without having a device in the ear. They do not restore your hearing to normal but can make managing in everyday situations easier. A titanium implant that is positioned behind the ear in the bone. An abutment placed through the skin for the bone anchored hearing device to attach to. The bone anchored hearing device or sound processor that sits directly behind the ear. How Does a Bone Anchored Hearing Aid Work? When the sound processor is attached, it picks up sound the same way a traditional hearing aid would, however, instead of sending the sound through the hearing device into the ear canal, it sends the sound signal through the bone by transforming it into sound vibrations. Because of the titanium abutment, the sound vibrations are sent directly through bone which produces a clearer sound. When you click off the sound processor, for example when showering or sleeping, no sound vibrations are sent and your hearing will return to its original state. 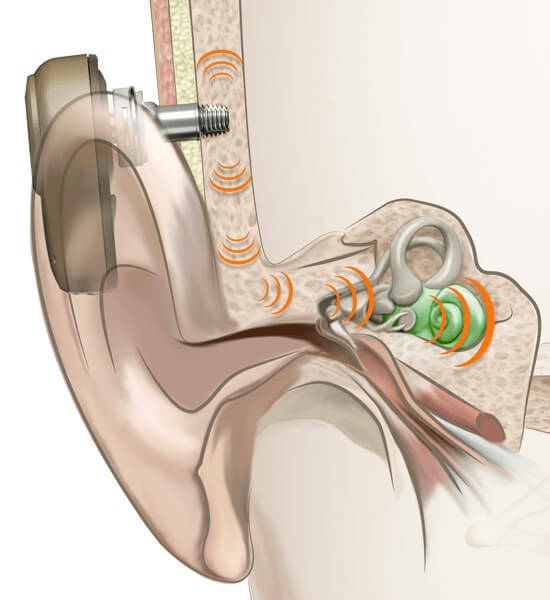 Bone-anchored hearing aids are surgically placed by an Otologist, usually performed under local anesthetic. Individuals who have hearing loss due to outer ear deformities or middle ear problems are good candidates for bone anchored hearing devices. These devices bypass any problems with the outer and middle ear and can offer clearer hearing. Bone-anchored hearing devices are also beneficial to some individuals with single-sided deafness.